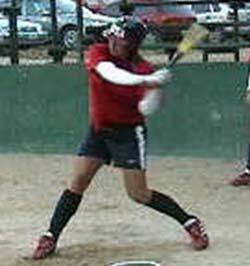 “Shaft to shoulder” is a great term used in hitting that explains what the hitter should do with their bat as they bring their hands forward into the swing. Basically, it means that the shaft of the bat (the bat itself) should be as close to the hitter’s back shoulder as possible when their hands come forward to the ball. What many hitters will do is “cast” or “bar out” their hands at the start of the swing creating a very large distance from bat shaft to back shoulder. I’ve found this term to be very useful to help players understand the need to bring their hands forward, toward the ball and their front foot, when they start their swing instead of moving their hands out toward the plate and keeping their hands behind them. Creating a small Shaft to Shoulder position can really help your hitters better grasp what we’re asking them to do with their hands.